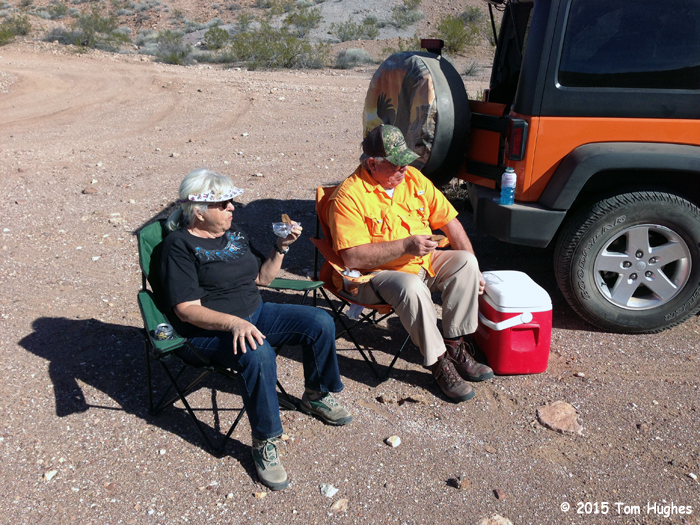 On Monday, about a dozen of us made a trip in seven Jeeps to a Talc mine about 25 miles north of Lake Havasu City. 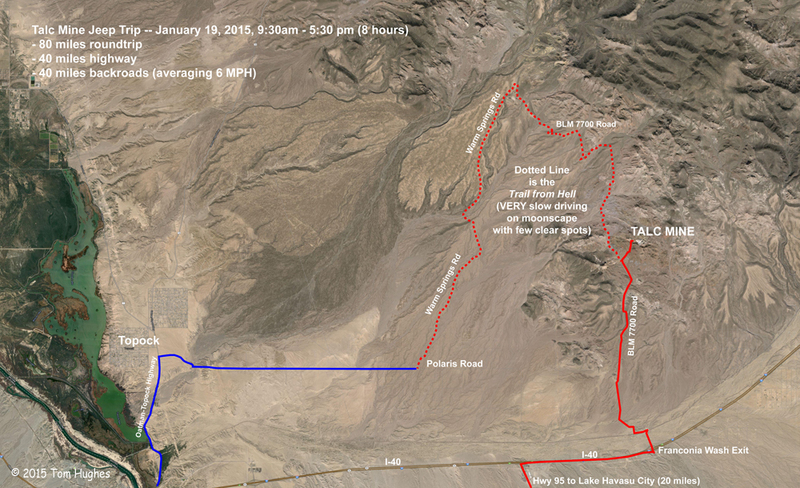 We gathered in the Crazy Horse parking lot and set out about 9:30 am. After 8 hours of some pretty hard driving, we returned. They say It’s the journey, not the destination, but in this case maybe not. After lunch it was time to head back, but we decided to try a “road less traveled”. “Road” may be overstating it. I think we went where astronauts practice for driving on Mars. It was rare to get up to 5 mph. Every hour or so of crawling across the moonscape, we would stop, get out our astrolabes, and try to figure out the fastest way back to civilization. Not a chance. We were committed to crawling. About 4 pm or so, I finally lost my mind, took the lead, and drove like a bat out of hell. Anyway, I finally arrived at a crossroads — I went West and everyone else drove East. By the time I found out there was no one behind me, I drove on . . . to Topock. During that drive Jan & I sold the Jeep, got divorced, un-sold the Jeep, and remarried. Arghhhhhh! Just a day later, we’re laughing about it, but, boy, are our bodies sore. It was crazy fun — would not have missed it. Kudos to Jim Kasper for his planning & patience (especially the latter) & to Ken Littleford for preventing us from falling into holes and over cliffs. MORE PHOTOS & VIDEOS . . . The 5th Annual Havasu Balloon Festival (January 16 – 18) is winding down. From what we remember of last year’s fest, 2015’s was much bigger — more balloons, more RVs, more people. Lake Havasu was crowded. It was great fun. Both Jan & I made attempts to see more of the festival this year. Jan checked out the action at Rotary Park Saturday morning, and both Jan & I got up early enough on Sunday to see the mass balloon ascension. However, getting breakfast in a local restaurant was waitful as everyone else thought it was a good idea too. The Havasu fest is much smaller than Albuquerque’s (70 balloons compared to 700), but I think the scenery is better — balloons + mountains + water. Here are some photos and video from the festival . . .
From the desks of The Onion . . .
News from CERN’s Large Hadron Collider where scientists discovered and then killed the God Particle . . .